Summary: While locked up for a minor offence, 19-yr-old JR (Thwaites) becomes apprentice to the enigmatic Brendan Lynch (McGregor), a calculating crime boss with connections both inside and out. After helping Lynch and his crew orchestrate a daring prison escape, JR is invited to join in on their next job – a high stakes heist that promises to deliver millions. But as they plan the heist, JR begins to suspect he is being played and soon finds himself on a collision course with his mentor in a very dangerous game. The heat is really on Australian films at the moment. Films this year that were supposed to be big hits – These Final Hours, The Rover and Felony – have all had dismal returns at the box office, and now comes Son of A Gun a film that has its producers (and the whole Australian film industry) watching with baited breath to see whether the inclusion of Scottish actor Ewan McGregor on the bill will be enough to make Australian audiences actually want to go and see the film in the cinemas. Of course as Predestination and The Rover found out earlier this year the inclusion of international stars like Robert Pattinson and Ethan Hawke on the cast list doesn’t necessarily guarantee that the film is going to make an impact at the Box Office either. 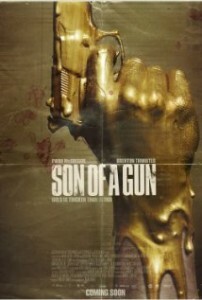 But what the producers of Son Of A Gun will be hoping is that the fact that Son Of A Gun is back in that gritty crime drama genre that has seen films such as Animal Kingdom become a hit in the past. From first-time director Julius Avery, who has built a sturdy short film career, Son Of A Gun sees young small-time criminal JR (Brenton Thwaites) suddenly thrust into the rigours of a tough prison environment. While the brash young crim feels that he has what it takes to survive he suddenly finds himself needing the help of seasoned notorious armed robber Brendan (Ewan McGregor) who takes the young man under his wing and includes him in his plans for a violent prison breakout and resulting major heist at a Western Australian gold mine. On the outside though JR and Brendan don’t find things to run as smoothly as they hoped. Brendan says that he is a crim-of-his-word although his honour is tested when they become involved with a rich mobster named Sam (Jacek Koman) who is money hungry and has no time for JR… especially when he sets his sights on one of Sam’s girls an immigrant named Tasha (Alicia Vikander). But of course it takes more than some big names and a well believed in genre for a film to work and sadly it is in other areas where Son Of A Gun is largely let down. Early on things seem promising for Son Of A Gun it has all the grit and intensity off prison/crime films like Everynight, Everynight and Animal Kingdom while the actual prison breakout and some of the car chases almost lift this film into the action film genre, but this film is dangerously let down by some of the film’s slower moments. At times the film seems like it wants to touch on the gangster romance element that made Two Hands so popular but the relationship here never wins the audience over the same way that the Heath Ledger/Rose Byrne chemistry did in the Aussie classic while the films last quarter is a massive let down. After the gold mine heist the film seems to lose its way, so badly that the ending feels like something you would have expected to see in a trashy American film like Wild Things. And of course if you’ve been a loyal audience member and kept a track of all the crumbs and sign posts that Avery has left so blatantly throughout the film you may get a really early sense of exactly what the big suspenseful moment is going to be during the finale as well. The one thing that does lift Son Of A Gun up though, aside from the first brilliant twenty minutes, are the cast. Ewan McGregor does show that he is a class above everybody else in the film with a strong character performance that almost seems him become the rough-and-ready Brendan. He is well supported by young gun on the rise Brenton Thwaites whose tough boy image is very different to the pretty boy he recently played in The Giver. The rest of the cast however are not quite so lucky. Alicia Vikander is given very little to work with at all. Her character motivation is weak and she quickly becomes a cliché as does many of the other ‘baddies’ in the film, a shame when you realise that actors such as Jacek Koman are capable of pulling off some really dramatic roles when they are called to. The big crime though is the treatment of Vikander whose role is so weak you can only wonder why she bothered making the trip out to Australia to make the film in the first place. Her performance is good, but the script lets her down. Son Of A Gun is a film that seems like it is desperate to make the same grade as classic Australian crime films like The Boys, but sadly the films weak last quarter really drags it down and leaves a bad taste in the audience’s mouth. Worse is the fact that the opening of the film is so good that you are left wondering how the same screenwriter could be responsible for such a letdown of a finale. Son Of A Gun may briefly breathe life back into the Australia film industry but it is certainly not the saviour that everybody was hoping for.